Black Mountain is a prominent peak at the southern end of the White Mountains, named for the black volcanic rock comprising its summit. 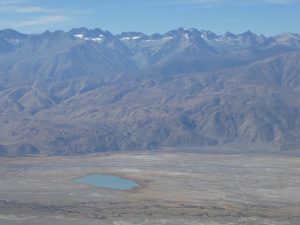 It is normally and most easily climbed from the high White Mountain Road. However, this would have involved a bunch of driving and not much hiking, so I decided to approach from Black Canyon, where the topo said there was a trail leading most of the way up. Although this trail was ominously marked “location approx” on the map, the route turned out mostly painless, an easy day with a bit less than 4000 feet of gain. I drove partway up the slowly-deteriorating Black Canyon road, parked at a wide spot, then hiked the remaining mile or so to the split between Black and Marble Canyons. 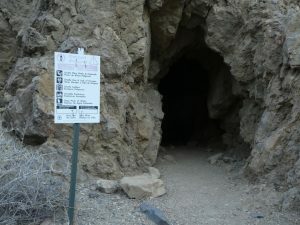 There was a sign near one of the mine shafts suggesting that entering would cause certain death by a combination of falling, drowning, and poisonous gases. Poking my head in, I found that it was blocked off, anyways. 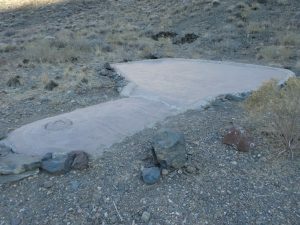 I had also noticed a mysterious “guzzler” on the topo, which turned out to be some kind of large concrete-covered cistern, still holding plenty of water. The road continues up Black Canyon to the north, apparently deteriorating to a trail just before connecting to the White Mountain Road near Schulman Grove. Marble Canyon is apparently too narrow to have a road or trail, but the map shows a trail leading up an unnamed draw to the south, eventually ending on Black Mountain’s west ridge. The start was not encouraging, a generic desert wash full of scoured boulders and woody plants, the latter making me regret my choice of shorts. However, about a quarter mile up, I found a faint trail-bed on the right side. I followed this up the streambed for awhile, then noticed a faint switchback out of the creek-bed to the ridge on its right, somewhat below the dashed line on the map. 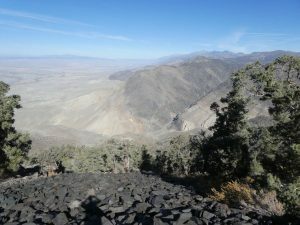 I repeatedly lost and refound the trail as I made my way up the broad ridge, but the terrain was open enough that it did not really matter. I again picked up the trail near where the map suggests that it crosses the next wash over, then lost it again for good after a couple of faint switchbacks. The trail supposedly contours across a loose talus slope between 7800 and 8000 feet to end on the easy east ridge. I saw a mine shaft over there, and found stake on my side, but couldn’t find any trace of a trail on the unstable slope, and didn’t see any reason to sidehill across. Instead I went more or less straight up the north rib/slope toward the summit. This started out easy, until I ran into some cliffs. Passing these on the left via some pleasantly stable basalt talus, I rejoined my rib above the cliffs, just below where it joined the east ridge. From there, it was a short hike through scrub, pines, and cactus to the summit. I found the usual desert summit ammo box, containing a not-very-old register with a surprising number of entries, including a number of familiar names. I added my own, then retraced my steps. The talus was probably slower going down than up, but not seriously frustrating. I was done by early afternoon, giving me plenty of time to clean up and catch up.